Coinciding with the recent 105th anniversary of the Triangle Shirtwaist Fire and just in time for Labor History Month, NYU has revived and restored the 1937 musical “Pins and Needles,” one of the first musical theatre works to deal with the topic of organized labor. Originally conceived as a community theater show sponsored by the International Ladies Garment Workers Union, “Pins and Needles” is a lighthearted and pro-labor depiction of workers in a changing society. The 1937 show, with music and lyrics by Harold Rome, was cast with actual union workers who rehearsed after work and performed Friday and Saturday nights at the Princess Theatre on West 39th Street. The show’s popularity was so immense that the cast ultimately abandoned their day jobs to embrace a full performance schedule of eight shows per week, marking the only time in history that regular workers – who were not trained actors – were able to bring a successful musical to Broadway. “Pins and Needles” ran for nearly four years with several editions and road tours. Throughout the run, material was added and dropped to keep the show current. As a result, the show did not exist in a specific, static form. The current revival had to be reassembled from original source material, which the Harold Rome estate provided. 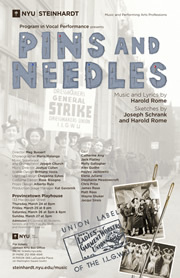 “Pins and Needles” was one of the first musicals to deal with labor issues. When it first ran in 1937, the actors were untrained garment workers. The show became a smash success. Recently, NYU restored and revived the show. Director Meg Bussert, a Tony Award nominee and World Theater Award winner, worked with Local 802 member Joseph Church, who was the show’s orchestrator and music supervisor. (Church’s Broadway credits include “The Lion King” and “The Who’s Tommy,” both of which he music directed and supervised.) Church wrote new orchestrations that honored the unique style and humor of Harold Rome’s songwriting. Bussert rehearsed the production as a workshop, a process that allowed the cast time to discover their characters and situations. The show also paid tribute to the Triangle Shirtwaist Fire, the deadliest industrial disaster in the history of New York City, which caused the deaths of 146 garment workers and sparked a legislative battle for improved, federally mandated labor conditions. In honor of the anniversary, which took place on March 25, representatives from theatrical unions attended a special showing and participated in a talk-back. The cast and musicians were all students of NYU’s Steinhardt Department of Music and Performing Arts Professions. The program in vocal performance produced the show, which ran at the Provincetown Playhouse at 133 Macdougal Street. 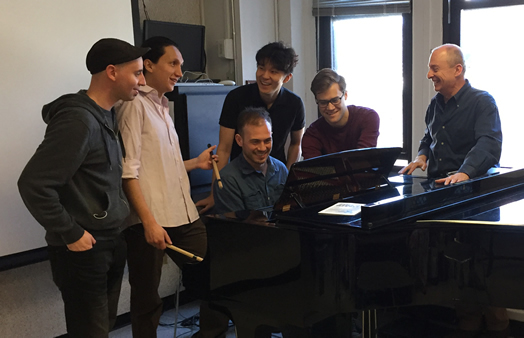 The student musicians were paid under a UAW Local 2110 union contract, which covers NYU’s graduate students.